As the U.S. electricity sector continues to undergo market shifts, grid operators in the competitive wholesale electricity markets are responding to those changes in a variety of ways. Their decisions have far-reaching impacts for states, utilities, merchant generators, new energy technologies, and consumers. Many of these interests have found help navigating the uncharted territory with Duke University’s Nicholas Institute for Environmental Policy Solutions. For several years, Nicholas Institute staff have produced analyses of the sector’s evolving dynamics and convened decision makers and stakeholders to discuss options for accomplishing a range of goals within the PJM region, which includes the District of Columbia and all or part of Delaware, Illinois, Indiana, Kentucky, Maryland, Michigan, New Jersey, North Carolina, Ohio, Pennsylvania, Tennessee, Virginia, and West Virginia. In particular, the workshops that the Nicholas Institute has co-hosted with the Great Plains Institute (GPI) since 2015 have become increasingly important learning opportunities—ones that strike a “good balance” between presentation of “high-level information” and “closed-door regulator-only discussion,” according to one participant at the latest workshop, in Washington, D.C.
That workshop brought together some 150 air and energy regulators—including then Federal Energy Regulatory Commission (FERC) Commissioner Robert Powelson—utilities, other power providers, and investors to consider the increasingly complex task of responding to the changing power generation mix. 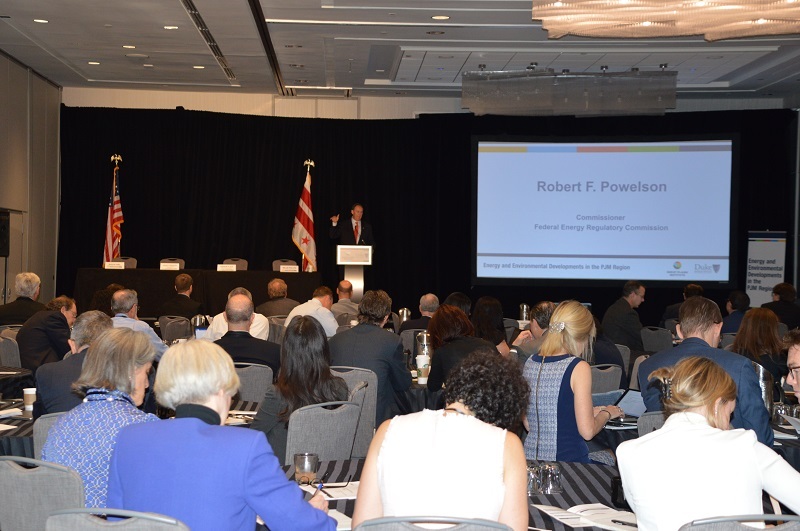 Participants heard directly from the PJM about its proposed market rule changes as well as from state officials and power generators, who shared perspectives on those proposals and other energy generation trends. Each workshop and research project is designed to cater to the evolving information and analytical needs of stakeholders and decision makers. “We learn what’s on our participants’ minds and that helps us shape our agendas for upcoming events as well as think about where we want to put our research efforts in the short and long term,” said Nicholas Institute senior policy associate Jennifer Weiss. Last year, she noted, there was interest in a carbon pricing framework that could apply to the entire market or a sub-region of PJM states. In response, the Nicholas Institute and GPI hosted a 2017 workshop that highlighted some of the thinking about the framework. Work on this project is supported by the Energy Foundation. Images courtesy of Jen Weiss.